It was a night to savour for Spurs as they sought their revenge on Arsenal after a previous derby day dubbing. 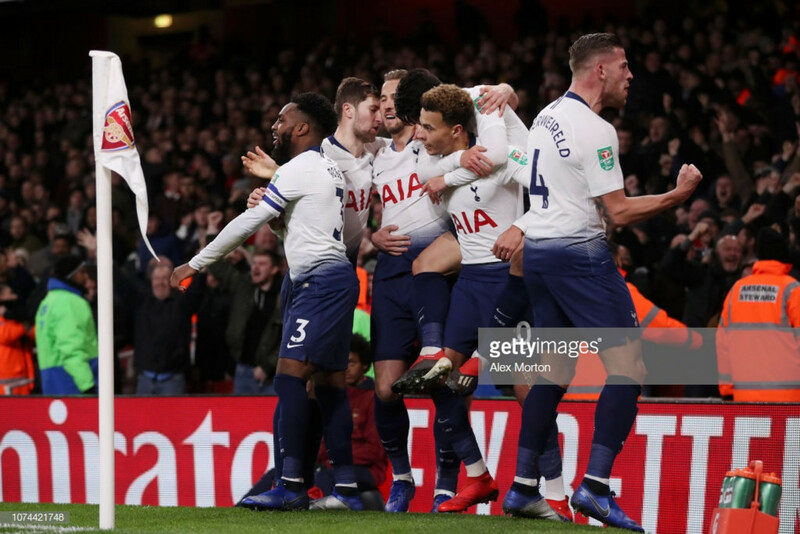 Tottenham Hotspur enjoyed a 2-0 derby victory over their local rivals Arsenal in the Carabao Cup quarter-finals on Wednesday. Spurs suffered a 4-2 defeat in the Premier League clash just a couple of weeks ago but Mauricio Pochettino's men certainly sought revenge. The victory puts Tottenham through to the last four of the competition where they will face their other London rivals, Chelsea in the semi-final. Since joining Spurs, Dele Alli has always been capable of scoring on the big occasions and Wednesday night was no different. His forward run was not tracked by what was a pretty shaky Gunners defence on the night and the 22-year-old's finish was cool as you like. One-on-one with the experienced Petr Cech, Alli delicately dinked the ball over the Arsenal keepers head to double the lead. That goal brought Alli's Tottenham tally up to 51 goals in all competitions since signing - quite the record for a 22-year-old. However, it was not just the goal that impressed. Over the past few seasons, we have seen an immature side to Alli which you would expect from such a young star. Yet, on Wednesday night Alli kept a level head and let his football do the talking despite being hurled verbal and physical abuse from the home fans. A reflection of how this young sensation is becoming one of Tottenham's most established players. After just 66 seconds from coming on, Harry Kane plucked the ball out of the air, turned and played a delightful ball to Dele Alli who then doubled the lead. Although Spurs had the lightning pace of Heung-min Son and Lucas Moura up top until the hour mark - they did not have the hold-up play Kane provides. After Kane came on, Spurs suddenly had the target man they were screaming out for. Granit Xhaka and Sokratis Papastathopoulos could not cope with the power Kane brought to the game. It was just 17 days since Spurs suffered a 4-2 drubbing at the Emirates Stadium in the Premier League. However, Mauricio Pochettino's side certainly sought their revenge in what was a professional display. Much like the league game, Spurs took a lead into half-time but this time they were able to build on the lead and secure the victory. Unlike the league game, Pochettino matched Unai Emery in making substitutions to help his side add to their lead rather than making changes when Spurs had conceded. It was a night where everything clicked for Spurs who are now just two games away from a Wembley final. Spurs now face their fourth London derby of this Carabao Cup run. After the Arsenal win, Spurs were drawn against Chelsea in the semi-final. The Lilywhites have already beat the Blues this season in a 3-1 victory at Wembley where Spurs blew away Maurizio Sarri's side. Should Spurs progress to the final, they will face either Manchester United or Burton Albion.